Had a client that wasn’t receiving certain emails from important clients. I allowed the email address in Exchange, but the emails still didn’t go through and the sender never got a bounce back. I tested on my end and got a message that the attachment was too large. I jumped into exchange and increased the allowable size. This article showed me how. I recently install Ubuntu 14.04 into a Oracle’s VirtualBox. This went fine, but I was unable to get the desktop to resize to my host machines. I selected “Devices >> install guesst additions”. It installed and I restarted, but still nothing. I tried manual ways and bunch of stuff, but nothing worked till I ran this command in terminal. Restarted the virtual machine and everything worked. laranitas free content source – for real? This service commented on this site so I wanted to see what they wrote. The comment was in broken english, so I made the title reflect their comment. This service takes / scrapes content from other sites, rewrites it, and posts it back on to your site. My content comes from my experiences, and is written so I remember how to fix thing or helps someone else fix things. This site is built with WordPress, and I have been getting a lot of spammed comments in the past few months. No harm on the site …yet. Had a client that had an issue with Microsoft office 2010. They clicked into the search bar and the search tools in the ribbon showed up but were grayed out. It turned out to be a indexing issue. Here is how it was fixed. I was given a project that uses Asido PHP Image Processing Solution. I couldn’t get the Asido to work in the recent version of WAMP 2.5 or on my CentOS virtual server. I did get it to work on another machine running WAMP. Turns out Asido works with PHP 5, but not 5.5. The major issue is was “allow_call_time_pass_reference” was set to off. This function is depreciated in 5.4. I uninstalled WAMP 2.5 and installed 2.0 which uses PHP 5.3 and Asido worked. Here is a link that sort of lead to the right path. Had a friend with an issue with Chrome not opening. In the task manager the “chrome.exe *32” process was running. I ended the process. Chrome would open, but unable to browse to any sites. I found this link and fixed the problem. Basically, unhide all files so I could get the “C:\Users\username\AppData\Local\Google\Chrome” and deleted the “User Data” folder. Restarted Chrome and everything worked. I had a second client with Chrome suddenly just not opening. I ran through the first process and deleted the “User Data” folder, and Chrome would open but wouldn’t complete the action of displaying the page. I uninstalled Chrome, ran ccleaner, and reinstalled Chrome and it all worked again. I hope this helps someone else…. In setting up a Facebook Plugin for WordPress I needed my facebook ID. It is no longer just in the URL. 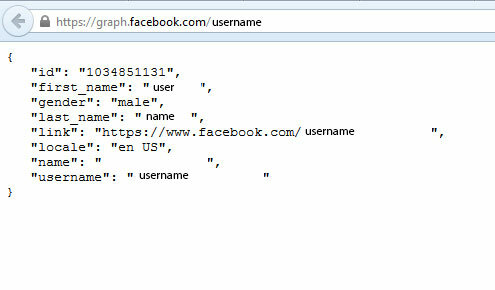 Go to your facebook page and change the “www” in the URL to “graph”. Here is an example. This did not work for the first time I tried, but eventually it did give me this. I found this article which helped me locate my ID. In addition, I needed a customers ID and I used this link to retrieve it. I just used the URL of their facebook page.